How do you get students engaged into writing? Sometimes this question feels like an exercise in futility, used as for abstract debate for the sake of venting frustration. But there are times when the answer to this question is simple: Make the writing interesting and meaningful. Some people like to write. Lots of people like to tackle an issue or topic of personal interest. While this concept is simple to focus on, the implementation can feel too complex and frustrating. One solution—I would emphasize this is just one—is using RAFTs as a writing strategy. It creates highly engaging topics, and provides a structure that students can easily understand and teachers can coach writing. RAFTs are also great for differentiating based on diverse skill levels. Provides a perspective or point of view for the writer. Students use the role as way to connect directly with the content focus. Gives focus to who the writer is communicating. Being mindful of the audience, teachers can coach students on perspectives to explore that the target audience may be receptive. This leads students to think about word choice and what details will resonate with their audience. Provides the medium through which the writer will communicate. The product, when assigned, is usually how the teacher needs to evaluate the work. 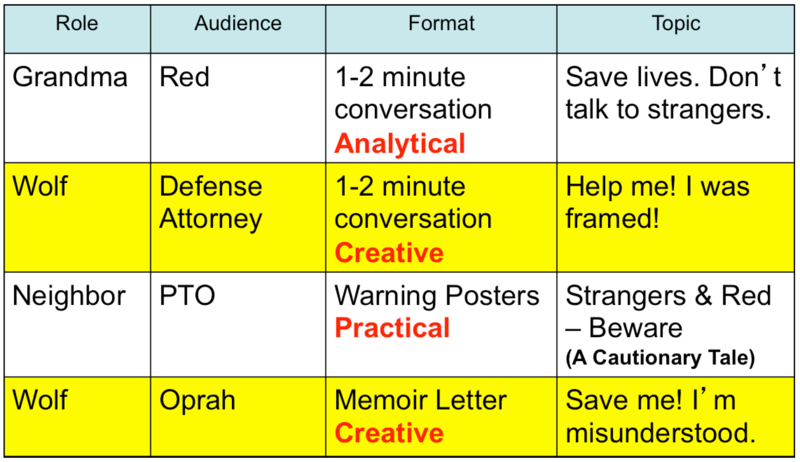 Sometimes the format is left blank to allow the students to chose the product that appeals to them, such as a podcast, video, story, poem, or some other medium. So long as the academic criteria is clear, the format can be open-ended. Topic + strong verb: Wedding or Eloping, which could best bring peace to our families? Communicates to the writer the focus of the RAFT assignment. The topic gives the context for the writing based on the academic outcomes. It creates the scenario or approach towards a real world issue that the students will communicate about. Including a strong verb generates engagement by potentially creating a call to action. As an opener for a traditional or Project Based Learning (PBL) unit, RAFTs engages students into the big idea and essential learnings to be explored. Crafting a topic that tightly aligns with the learning outcomes gives students context for learning, and opens opportunity for generating students’ need to know more. RAFTs make for formative assessment in the middle of a unit. Students demonstrate their understanding that should go beyond the facts to analysis or evaluation of concepts. Used as an individual or small group activity, students process their understandings and connections for deeper knowledge. The results will better prepare them for the later work of the unit. Teachers can use the RAFTS products to give formative feedback to the students to firm up content knowledge, and to coach writing skills. Focus: Understand how “Romeo and Juliet” by Shakespeare represents the challenges for effective communication and conflict resolution. Once students experience the RAFTs structure and become familiar with it, they embrace it. After awhile, let the students come up with their own Role, Audience, Format, and/or Topic. Or let them develop a combination of certain parts. This gives them voice as to how they want to construct the writing, which increases their buy-in and engagement. Rate yourself on a 5 pt scale. Yes, I know… rating scales should avoid an odd number range because people tend to gravitate to the middle number, in this case the 3. But in this instance, who wants to be a 3? If your surgeon self-rated his/her skills at a 3 on a 5 pt scale, wouldn’t you get a second opinion?While a self-rating of 1 is rare, 30% of the audience, at best, self-rate a 4 or 5. Writing skills are so important for students, yet the perception of less than half of their teachers feel confortable or confident with their own writing skills. Such revelations is food for a conversation on a later article, the intent now is to emphasize the need for writing activities that provides a structure for effective coaching and learning. 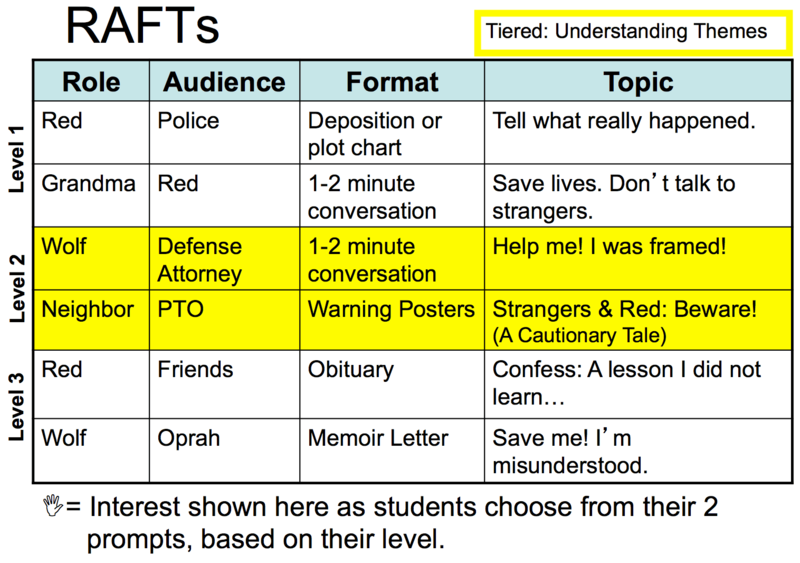 In a previous article, I talked about RAFTs as a framework for engaging students into writing for purposeful topics. Mentoring students to become better writers is an important process. RAFTs is an effective strategy that can support the coaching process. 6+1 Writing Traits by Education Northwest is the reference that I use in the following conversation. The rubrics are useful for coaching. Role: When the writing needs clarity about author’s intent, students should reflect on the role they are playing, and the intentions and needs of the point of view. This could affect word choice and details that may need to be added and/or changed. Word Choice: If the story happened today, what words would Juliet, age 13, use to express her emotions a marriage and family? Details: What details would Juliet share with Romeo to convince him regarding the topic? Details: Which of your details would Juliet have more to share based on her experiences from the play? Audience: The details and organization of the writing may not communicate clearly to the target audience. Coaching questions could lead to the student considering their audience’s needs and what information would elicit a positive response. Word choice, organization, and details would be areas for writing instruction. 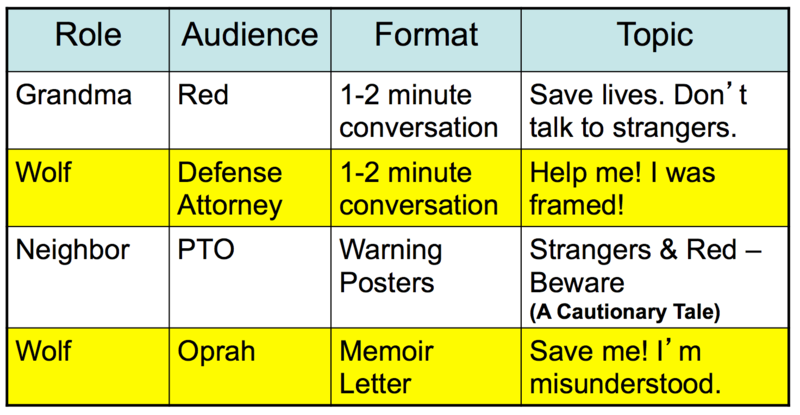 Sentence fluency could be another factor depending on the reading level of the audience. Lower elementary students may need a simpler sentence structure than an adult audience. Do we want a 6th grade sentence simplicity or more complex writing structure for an academic audience? Organization & details: How are your main ideas ordered so that Romeo would be most receptive? Let’s talk about each together. Word Choice & Sentence Fluency: Knowing Romeo’s personality, how might he react to the tone of this writing? Details: Let’s identify discussion points that Romeo might need for context and/or information to be convinced by Juliet. Format: Our choice of medium should align with the target audience. Teachers and students explore together the question: Does the medium allow for effective communication of content and complex ideas as intended by the author (Role)? This question looks at organization, details, and word choice that are appropriate to the medium. For example, PowerPoint and Keynote presentations work effectively with minimal text. Presentation, Organization, and Word Choice: How should this medium be used to keep Romeo’s attention? Presentation, Word Choice, and Details: What could be used to connect with Romeo through emotions and/or logic? Topic: How well does the content align to the topic? Organization and details are important coaching conversations to ensure that the focus is addressed. Organization and Details: Let’s identify where the content deeply supports the topic and where the information may not relate to Juliet’s discussion points. Details and Word Choice: Where do the main ideas help Romeo agree, and where might he respond with a counter argument based on the topic? There are more questions that teachers could devise based on the RAFTs components, the content of the writing, and the students’ understanding and intentions regarding the topic. These coaching conversations will give students a scaffold structure for understanding the assignment and how authors craft writing for a purpose. During the course of a few RAFTs experiences, students will strengthen their dialog for coaching each other by using the components as feedback starters. The teacher’s modeling of the conversation will guide students to coaching each other, which leads to empowering them as stronger writers. RAFTs can ignite engagement and context for learning. Planned with forethought, students can explore a need or problem that exists in the world beyond the classroom walls. An important consideration is: How do I differentiate RAFTs to support my diverse learners? The solution is simple, yet has layers of possibilities when implemented based on an understanding of your students. The key step with differentiating RAFTs is provide 3 to 4 variations of the prompt. Giving students one RAFTs to unpack can be engaging and productive. Consider than the possibilities when students have several choose from. The Learner’s role in Differentiation is based on Readiness, Interests, and Learning Profiles. Use the Learning Profile Cards strategy to collect data on students that will inform differentiation of RAFTs that follow. Interests are activated by giving students several options to choose from. Take this even further by having a blank option—allowing for students to craft their own RAFTs based on the topic–a great way to foster Student Voice. When learning profiles are intentionally integrated into the prompts, teachers can assign them to specific students based on learning data. My personal preference is to let the students choose. Students will either pick the one that makes sense to them the most (learning profile) or pick the topic that intrigues them (interests). It’s a win-win when students choose. Readiness: Differentiating RAFTs based on Readiness requires the most planning, which results in worthwhile learner experiences. Sometimes students have different levels of a skill or concept. 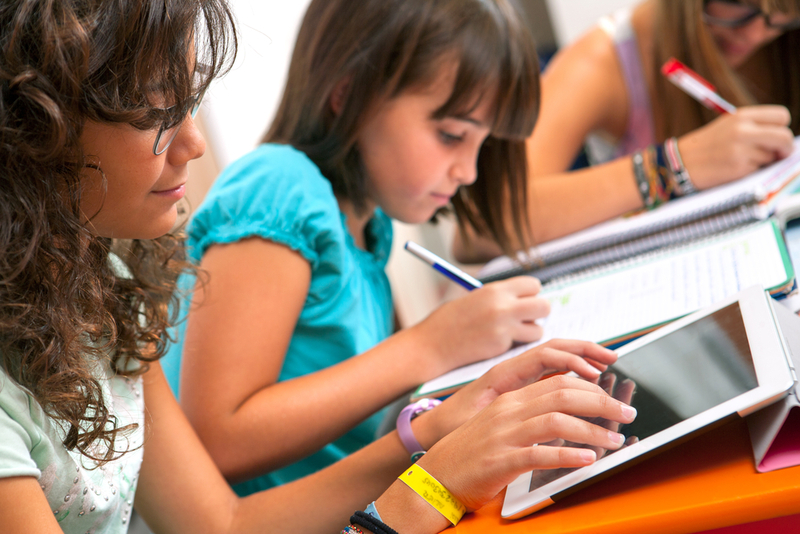 One to two prompts are crafted to match the academic level of each group of students. Having more than one prompts encourages student interests because they have choices. Prompts are assigned based on formative assessment data. The learners, individually or in groups, work at the RAFTs that will stretch them appropriately. RAFTs is a strategy that has multiple ways to use for meeting the needs of all students, based on where they are at, and identified needs. Check out the previous articles for a full picture of supporting students through RAFTs.